I sometimes come across customers that would like to relay email through their Exchange Sever from external clients and maybe use a different sending address. Here is how I configure this. Now we have created the Receive Connector, and you will see this in the Exchange Management Console. Now we can verify the network, authentication, and permission groups settings to see how a Client receive connector has been configured. If you go to the properties, you will see that it’s listening on port 587, that it has enabled Basic authentication over TLS, and that it is only allowing Exchange Users (Authenticated Users) to connect. You will see all of this by looking at the connector in the Exchange Management Console. If it says under user “NT AUTHORITY\ANONYMOUS” then you have an open relay. Stop and delete the connector! Next, we need to set some additional parameters to make this work. 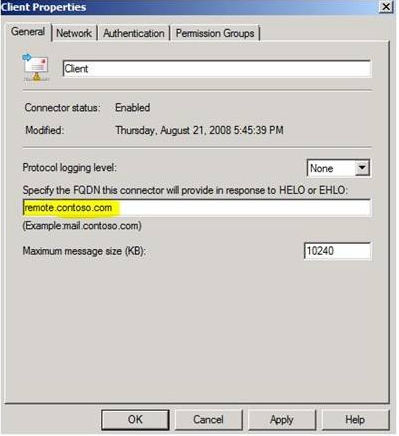 Get-ReceiveConnector ExternalRelay | add-ADPermission -User "NT AUTHORITY\Authenticated Users"-ExtendedRights "ms-Exch-SMTP-Accept-Any-sender"
If you have successfully run the Internet Address Management Wizard from the SBS Console, then your Exchange certificate for TLS has already been installed and configured. You can verify this by running the Get-ExchangeCertificate commandlet and find the certificate with your external DNS domain name. The certificate will have IPWS listed under Services, which stands for IMAP, POP, Web and SMTP respectively. The client machine must trust both the Exchange certificate and the Root CA in which it was created from. A good test is to open IE on the client and browse OWA to see if you get the certificate warning(s). 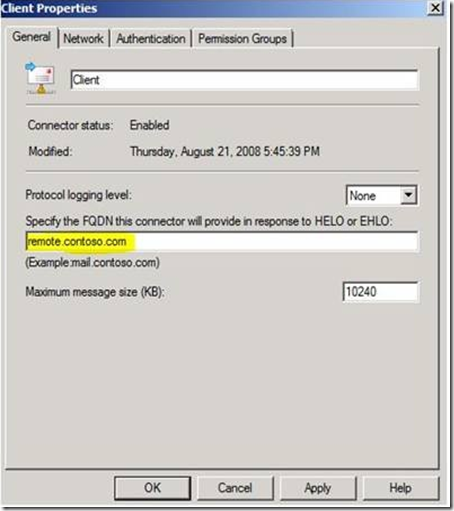 You must configure the mail client to connect on port 587 and to send the proper credentials for authentication.